One of our biggest expenses every month is our grocery budget. We try to cut it down each month but it seems to keep creeping up. Reducing your grocery spending is easier than you might think. Keep reading if you want to learn how to start saving this month. Learning how to save on groceries each month can be hard for many reasons, such as a growing family, hosting a holiday meal, or building/refilling your stockpile. It is possible, however! According to data from the USDA as of November 2018, the average family of 4 will spend somewhere around $800-900 per month on food, assuming average shopping habits. That’s nearly $10,000 per year! Our grocery shopping has been only a few hundred each month, at least half that average cost. Imagine what you’d do with an extra $5,000 per year to put towards other things! One of the easiest ways to save money grocery shopping is by meal planning. The only problem is coming up with different meals week after week is time-consuming and difficult. Luckily $5 meal plan takes all the stress out of meal planning by sending you recipes and shopping lists straight to your email! 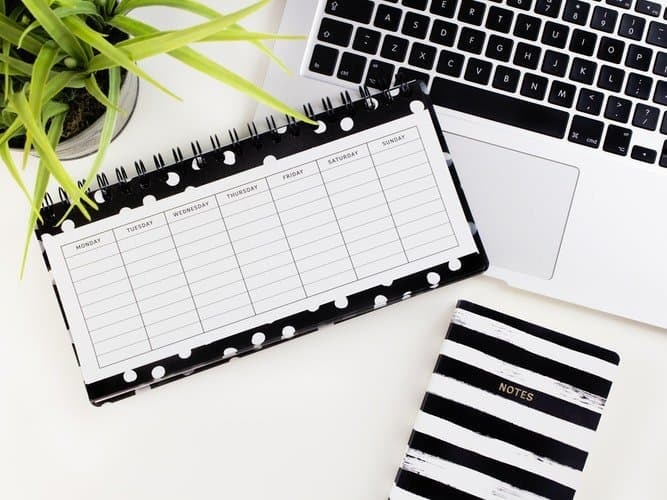 Are you ready to get your monthly budget back in order? Let’s do this! I’m sure you’re wondering what sacrifices in your health you might need to make in order to save money grocery shopping. Believe it or not, it is a lot easier than you’d think to save money and still start eating healthy, cheaply. As you’ll see on this list of tricks, little things like making your own breaded chicken pieces will be cheaper (and hardly less time-consuming) than buying pre-breaded tenders from the frozen section. Because you’d be making them with fewer and more raw ingredients, you’re removing a lot of processing out of your food, which we all know is good for you! Some of our other tricks are specifically aimed at helping you get high-quality fresh produce with your cost-effective food shopping. Most of the advice you hear to help you cut food costs consists of meal planning to save money and cutting coupons. Like we said at the beginning, meal planning doesn’t need to be slow and painful with an open cookbook, and it doesn’t need to mean you get lost and distracted for hours searching Pinterest for recipes. Your best bet will be to sign up for $5 meal plan. You’ll pretty much never need to search for a recipe for your meal plan again because the recipes come to you (right in your inbox)! And true, while cutting coupons can be an amazing way to save money on food, they’ll only actually help you if you’re buying brand name items. Some stores offer coupons on their own brands, but they are infrequent at best, so coupons might not be something you can use to reliably save money on food. We’re here to help you save money, and if we didn’t help with reducing one of your biggest expenses each month, we wouldn’t be doing a very good job! 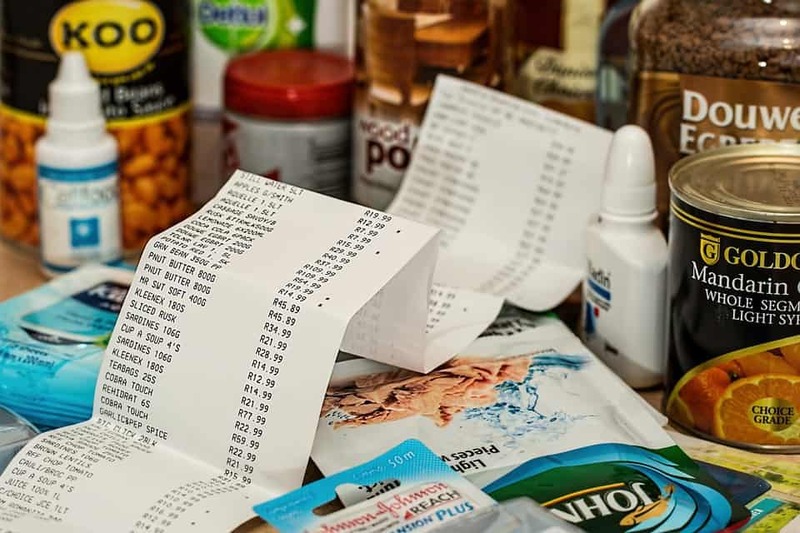 While groceries and household items can be your hardest thing to reduce, you can also see the most drastic results versus all your other spending, by using the budgeting shopping tips below. 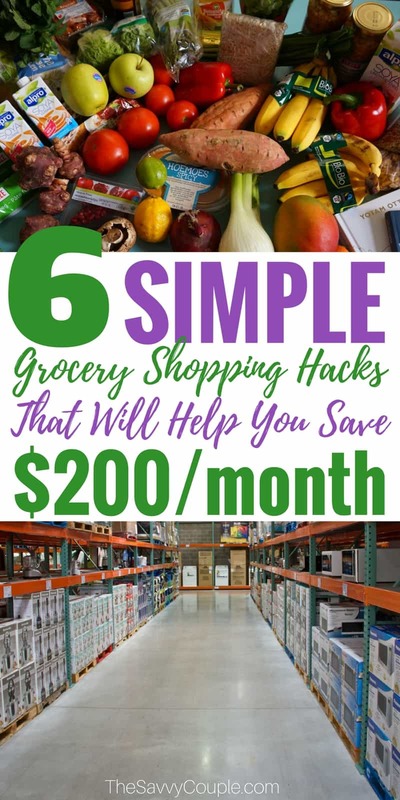 This list of 30 ways to save money on groceries definitely has tricks that everyone can use to shrink their grocery budget and feel like they have more money for groceries (or other expenses) each month! 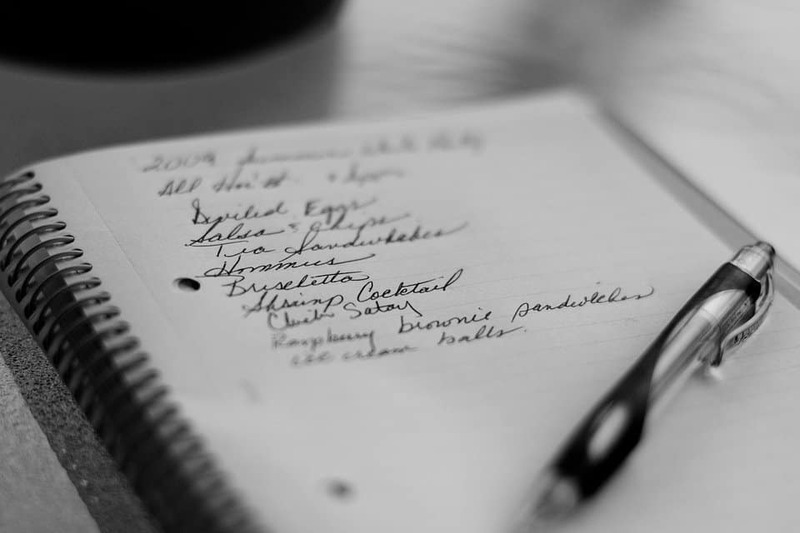 If you are headed to the grocery store, make sure you make out a list. And stick to it! You created the list in the first place for things that you NEED. There is always going to be items that you want, but you throw in a few of those items and you are raising your bill for no reason. Follow your list unless it is a deal that you can’t pass up or if you have a coupon expiring for something you need. This tip varies depending on your household and circumstances. For me, it is easier to meal plan for one week rather than two. After I pick out my meals, I make my shopping list. Using weekly ads to save on weekly grocery bills is also a benefit to making your plan by knowing what is on sale. You’ll absolutely save the most money by not even spending any in the first place! If you take the time to do a quick inventory of your pantry on a regular basis, you’ll probably be surprised by the meals you can come up with for your weekly meal plan without even needing to leave the house! While you’re checking your fridge and pantry inventories, make sure to check that you’re storing your food properly, to avoid food waste! 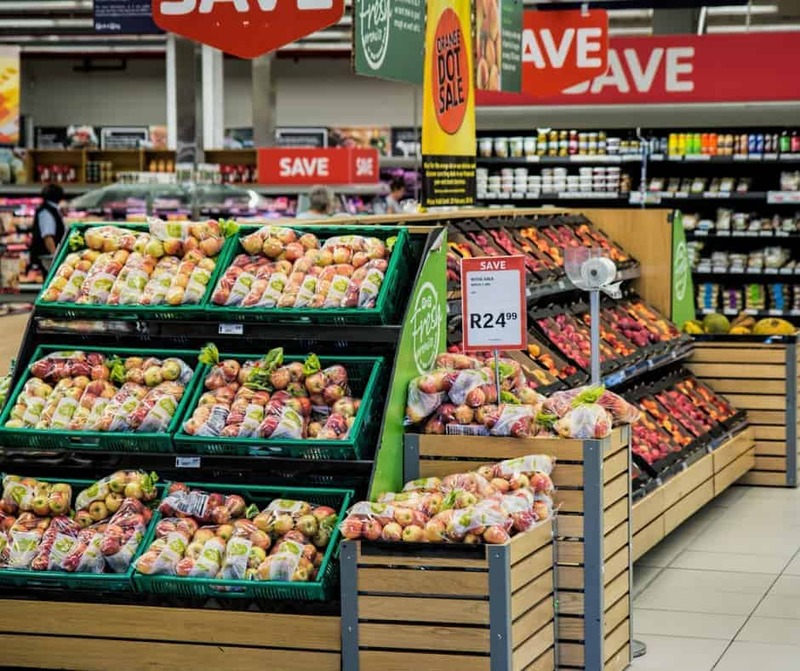 This is another one that should go without saying, but if you have to buy groceries (because your pantry really is out of stock), buying a given item when it’s on sale is guaranteed to save you money. What this means for your meal plan is that instead of planning to make, for example, steak this week just because you want some, you’ll wait to put it on the menu until you can get it at a killer sale price. Many people have a wholesale membership but wonder how to save money on groceries at Costco and similar warehouse stores. These memberships have their pros and cons. 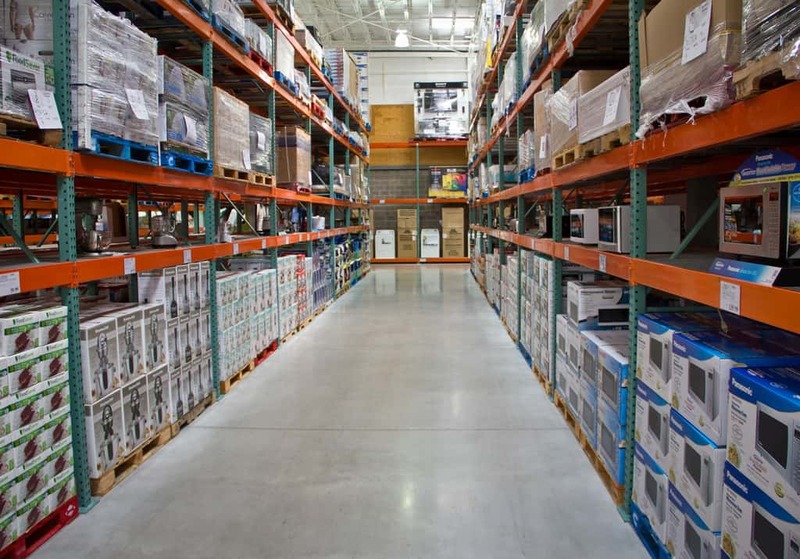 If you shop at wholesale stores frequently, then your membership is worth it. If you pay for a membership and go once a year, it’s most likely a waste of money. I get coupons all the time for a 90-day pass for a local wholesale store. Using this pass is better for us with how much we would end up going if we had a membership. Be smart with what you buy in bulk. If you go through paper towels or toilet paper quickly in your house, buying it in bulk will save you money in the long run. Most grocery stores offer items like meat and dairy products in sizes that will be enough for one recipe, but also in sizes that would feed a small army in one sitting. These giant “club” or “family size” packs are the ones that will have the best unit price. If it fits within your grocery budget for that week, buy the larger pack and split it up at home. A good example of this is ground beef – our local grocery store sells it in a 1-2lb tray or a roughly 6lb tray. No one needs that much beef for one meal! We cut the tray into 3-6 portions and put them in the freezer for later. Whether you put your small refrigerator freezer compartment to work for something besides ice cream, or you’ve got a large deep freezer in your garage or basement, making use of a freezer is a great way to stretch your grocery dollars. Like with the club pack example above, it’s a great way to take advantage of deals that wouldn’t be practical to purchase otherwise. You can freeze everything from meat to dairy products to fruits and veggies! MyFreezEasy makes our life so much easier by sending us healthy ready to eat meals for the entire family. The best part is their prices are GREAT. If you’ve done really any grocery shopping in your life, you probably know that meat is just about the highest unit price of any non-processed food you’ll be buying. By finding ways to either replace meats in a dish with things like beans and other produce or simply learning to do without it in certain dishes, this is a great way to save a ton of money each month! While some grocery stores use a “Manager’s Special” sticker to simply indicate the meat cut that’s on sale this week, others use it to indicate a package of meat that’s within a few days of its sell-by date. Don’t be afraid to ask the employees in the meat department/butcher shop about sell-by deals. We once learned from a butcher at our local grocery store that when they approached a certain date at the end of the month they’d start marking down meat prices to get it sold and avoid throwing it out. There’s nothing wrong with this meat, so either use it up before the date on the package or it can be frozen to use later! I know this sounds really counterintuitive, but bear with me. If a store offers an item at 10 for $10, how many are you going to buy? Most of us fall for buying 10 items to get that dollar-per-item price. Check your sales flier more closely, though. Many stores offer these in a “mix-and-match” way, which means that if, for example, cucumbers are 10 for $10 and bags of baby carrots are also 10 for $10, you can buy 5 cucumbers and 5 bags of carrots for $10, without needing to overstock and overspend on more produce than you needed! Along with this, while a 10 for $10 sale makes $1 per item a pretty good deal in most cases, you might find it’s only maybe $0.50 more to just buy one of the item and walk out of the store. Sure, the unit price is better with the sale pricing, but you might be spending $8+ more than you needed to if it was an item you really didn’t need 10 of! While there are definitely some grocery stores that really do offer the best price on just about everything, that probably won’t always be the case since you grocery list likely changes a little each week. Do a little math to see if it’s worth the drive to another store for a few more items, rather than saving yourself the extra stop. This is a HUGE money saver in our household! I do not bring Kelan grocery shopping with me anymore. He instantly will bring our bill up by $25-$50 when he goes shopping with me. We do not have kids with bottomless-pit stomachs yet, but I can imagine parents who bring their kids grocery shopping with them would also increase their grocery spending. When I went shopping with my mom I just put items in the cart. Heck, I was not paying for them! My poor mom must have spent a fortune by bringing us kids with her. Not to mention that bringing kids makes making those multiple stops for extra savings even more of a chore! 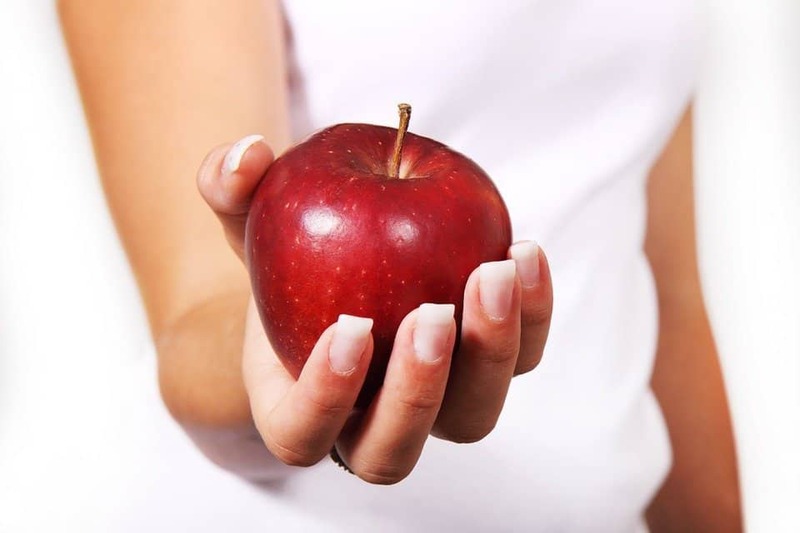 Have you ever stopped to learn what the “in season” produce is at any given time of the year? We live in a world where we can just walk into a store and buy practically anything we can think of regardless of what day it is. But it’s worth knowing that apples are cheapest in the fall and citrus tends to be much cheaper in the cold winter months (ever hear the phrase “Christmas oranges?” Now you know why). Buying produce that isn’t in season means it was harder to get it grown to the point of harvest and it likely had to be grown farther away from you and/or with greenhouse use, so it’s more resource-intense to produce and transport. Be mindful of this annual cycle and see the savings stack up! Buying produce straight from the farmer is beneficial not just for economic reasons but for health reasons too. Smaller farmers that you’ll meet at the market tend to offer organic produce for much cheaper than store prices, and you’ll also get the health benefit of locally sourced foods (shorter transport distance means fewer carbon emissions, local produce means local pollen so your allergies might even improve). If you do buy your produce from a grocery store, nowadays it seems like just about everything comes in “whole” or “sliced/washed/cleaned and cut” form. You’ll often find yourself paying nearly twice the per pound price, making it a convenience charge that really isn’t worth it! By this, I don’t just mean the hot, prepared foods that many grocery stores offer. What I mean by this is buying a block of cheese and grating it instead of buying pre-shredded cheese. Or buying chicken breast and putting your own breading on it instead of buying pre-breaded chicken pieces. Or choosing the pudding mix over the ready-to-eat pudding cups. Similar to pre-washed and pre-cut produce, you’ll spend a lot of extra money for someone else to do simple work that you honestly can do so easily yourself (for free)! There are admittedly a number of great pre-mixed seasonings on the shelves these days. But not only are you paying more for someone to combine the single seasonings for you, but you’re also potentially limiting yourself to what it can be used for. You’re much better off buying a few single jars of staple seasonings (salt, pepper, parsley, oregano, etc) and mixing/using them as needed instead. By something as simple as having a few container garden plants or even starting a small square-foot garden in your backyard, you can eliminate a large portion of your grocery spending each month during the growing season! Not to mention if you’ve got the room for a larger garden, you’ll be able to grow extra to store for the off-season, stretching your summer savings even farther. Earlier we talked about how coupons aren’t necessarily a reliable way to save money on groceries. So why is it listed here? Even if it takes a while between coupon dates if you do HAVE to buy something that is a brand name, for whatever reason, try your best to hold off on buying until you have a coupon. If you force yourself to wait until you can basically create your own sale, those few dollars off here and there can quickly add up over time! Here’s a little secret: even by using coupons, brand name items are often STILL more expensive than their generic or store brand counterparts. True, you might be an extreme couponer and know how to get your coupon use up to the point where the stores owe you money at checkout. But the rest of us don’t have the kind of time in our lives necessary to buy multiple newspapers or scour multiple sources for coupons and super sales. Here’s another little secret: using a cashback app like Ibotta is the best way to basically make your own coupons! While they often require brand name purchases, more and more they’re offering cash backon any brand, including store brand. If you aren’t using this simple app, you’re throwing money away! I used to hate having to stand there and wait for my mom to get her rain checks when I went grocery shopping with her as a kid. But now that I have a monthly grocery budget of my own, I totally understand! Unless it is specifically stated that an item won’t offer rain checks, it doesn’t hurt to ask for one. How many times have you gone to buy an on-sale item at an amazing price but the shelves are cleaned out before you could get there? Getting a rain check extends you your own private little sale for the next time that item is back in stock. Not all stores offer their shoppers perks or rewards for shopping with them; it’s worth checking into what your preferred store(s) offers (or switching to a store that does offer some). Whether this means you’ll buy groceries during a sale at Target to get an everyday 5% off with your Target credit card, or whether you’ll get rewards points on each purchase to work up to a certain cash reward threshold, these are the stores where you should focus your shopping list. If you can buy basically identical items for the exact same price, why wouldn’t you buy it from the store that gives you some sort of “thank you” for choosing them over their competitors? If you’ve got any knowledge of the manufacturing industry, you’ll know it’s a very common practice to manage inventory on a “FIFO” system – First In, First Out. You can apply this same practice to your home grocery inventory, by only using the oldest products first (to avoid wasting anything), and only adding something to the shopping list when you have or you’re about to run out. Meal planning is the first step, but it does you no good at saving money on groceries if you never do anything with the food you buy. Make time to either prep dinners ahead of time or use your lunch meal ingredients to pack the entire week’s lunches in your fridge in one sitting. Meal prep helps to ensure you’re not forgetting any of your ingredients until they spoil and end up in the trash. And don’t order take-out, either. You’re not only adding a tip for the waiter onto the cost of your meal, but you’re paying someone else to cook it for you. Have you ever thought about your meals in terms of “people cost” before? Sure, every so often for a special occasion we enjoy a night of not having to wash dishes, but for the most part I’d rather not pay someone to do something I’m perfectly capable of! If you include restaurant spending in your overall “monthly food budget,” you’ll save a huge amount of cash if you start cooking more. You’re probably assuming that by this, I mean saying no when friends or family invite you to a restaurant with them. While that’s definitely a learned skill for some people to be able to do, in this case, I actually meant being able to say no while you’re at the grocery store. If you’re strict about sticking to your weekly grocery budget amount, you might occasionally find yourself slightly over budget once you get to the checkout line. When the cashier rings everything up and it’s over your budget limit, you have to learn how to ask them to remove one or two items if needed to get your total back within range. For some reason, this is something most people feel embarrassed to do! It goes without saying that swiping a credit card is a lot easier than handing over cold hard cash. Call it efficiency or call is psychology, either way, $100 on groceries “hurts” more when you hand over the cold hard cash you had to earn than when you wave a little plastic thing around. Your best way to stay on budget and shop with cash is to use the envelope system, made popular by Dave Ramsey. Using cash, split your monthly grocery budget into 4 equal amounts, then put it into an envelope for each week. When you go to the store you’ll have no choice but to buy no more than what you’ve got the cash for. If you really still struggle with restraint and can’t stick to your list well enough, you’ll definitely want to consider using either store pickup or a grocery delivery service. Either option means that someone else is doing the shopping so you’ll never set foot inside the grocery store. You can’t put extra in your cart if you’re not even there! If you haven’t used a grocery delivery service before you’ll definitely want to check out Instacart. You just shop for your groceries online through their website or app as if you were making an online purchase, checkout, and await your grocery delivery. We started using it more once we had a baby in the house and it’s been amazing! Just make sure you choose a store that doesn’t mark up their prices through Instacart, or you’ll undo most of your savings! One way to cut grocery spending is to pay yourself back with a cashback app like Ibotta. In just our first couple months using it we earned over $100 cash back! Ibotta basically pays you for the items you are already purchasing. Search the app for items you plan on purchasing at the store. Add them to your rebates. Take your receipt from your latest purchase and scan it into your app. Ibotta will check that the two match and place the cash back in your account. You can sign up today and earn your first $10 cash back. How simple are these 30 ways to cut your grocery spending? How many are you already doing? They are simple enough to start implementing right away. In one month, just 30 days, you could see a significant decrease in your grocery budget. Freeing up money to put towards your debt, start an emergency fund, or even go on vacation. Start saving today! How much do you spend on groceries every month? Join us in The Savvy Couple Community on Facebook to learn even more ways to save! Start saving $100 to $200 per month by planning out your weekly meals. 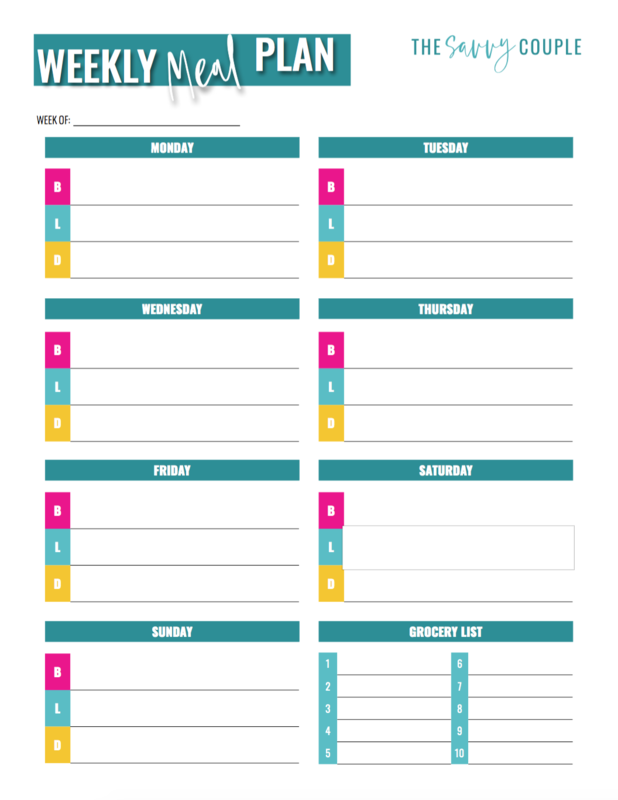 Grab our weekly meal planner for FREE now! Success, you are now a part of our savvy saving community! You will receive an email shortly with your FREE worksheet! This was a good read! I agree that grocery shopping weekly is helpful. Then you only get what you need instead of trying to anticipate a whole month. Yup, it can be a pain to have to go each week but it’s worked well for us. Even going every other week is better than trying to do it all at once for the entire month. Thanks for sharing! I agree about the bulk shopping. It needs to be strategic for it to be budget saving! Absolutely. The worst thing you can do is bulk shop and end up throwing items out. I have been cruising the internet for some helpful tips for my grocery “problem.” Since we paid off our house, it is currently our largest expense coming in at a consistent $500-$600 for a family of 3. Anyway, this is one of the best articles I have found on the topic! I love the mix of “psychological” advice along with actionable systems that could be put into place. Thanks!